Lent is officially here which means that I get to experiment with a ton of different seafood and fish recipes. I honestly love this time of year because it means that I get to create some of my favorite childhood dishes all the while waiting for Spring to finally arrive. It marks a new beginning and with it new energy. Today I’ve partnered with Clamato to bring you an amazing Lent-friendly seafood recipe. 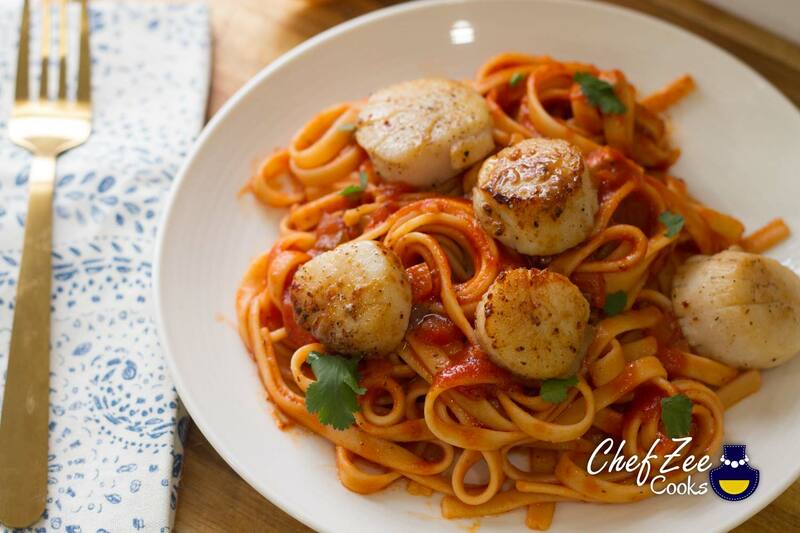 Today we’re making, Pan Seared Scallops with Spanish Style Linguine. 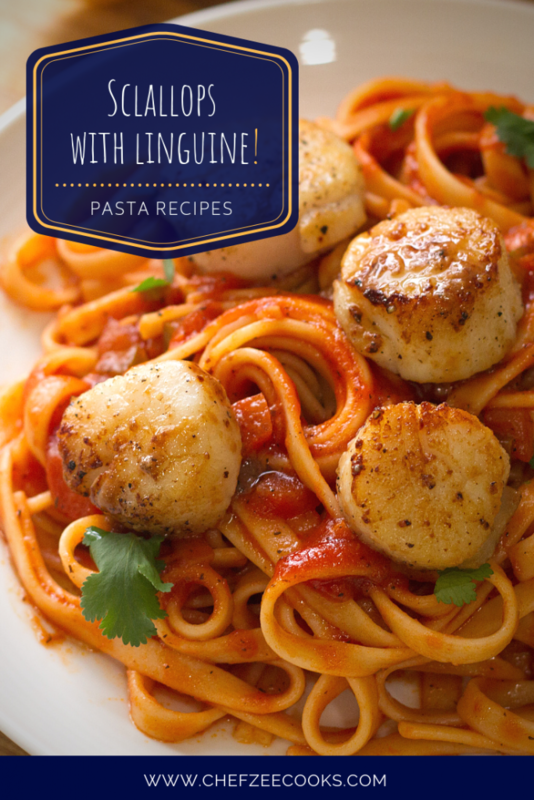 We’re going to be making the perfect scallops and pairing them with a pasta that’s in a sauce that’s too delicious to resist! If you’ve gone to Walmart then you’ll know that Clamato comes in all sizes. Today I’m using the 64oz bottle to create an amazing pasta sauce. If you love my Dominican Spaghetti recipe then you’ll definitely love this one. Think of it, as a close relative to my Dominican Spaghetti. Now when making scallops, know that less is more! Scallops are fairly pricey but you can always swap them out and use raw shrimp instead. Luckily, scallops are insanely flavorful which is why you don’t really have to do much to them. The key is to cook the scallops perfectly. I personally love the subtle sweetness that you get from fresh scallops. That alone is enough for me to buy them time and time again. Heat deep sided skillet over medium-low flame and add olive oil. Next add onions, bell peppers, diced garlic, pinch of salt and black pepper. Saute until the veggies have softened up. After 3-5 minutes, add tomato paste and tomato sauce. Let sauce come to a simmer and then add 2 cups of Clamato, cumin, and orégano. Mix everything until it’s well combined. Next, add 2 bay leaves and fresh cilantro. While the sauce is cooking, go ahead and prepare linguine pasta. Once linguine pasta has been cooked to al-dente, drain excess water and add pasta to sauce. Carefully fold in pasta and then continue cooking on low heat.